By Rasheed Catapang: There’s no denying the talents Mayweather have that makes him such a massive force to be reckoned with in boxing. In fact, I’d go on to say that at the moment there’s no one at or near his weight that could defeat him. He’s just that good. Sergio Martinez might be the Middleweight King. I’m sure he’ll lose his crown if he steps into the ring with Floyd. I’d love to see the fight get made though and see the whole process unfold just as I had imagined. Floyd is just that good. Floyd has that Rubicon he dared not cross. He’ll easily beat anyone at or near his division but the one man who sits atop his own. Perhaps by recognizing the gift of preternatural skills he had in himself, he was alerted the moment the same gifts manifest in others. And for one as risk-averse as Floyd, it must be one scary thought. Pacquiao, by Mayweather’s past and current stance, appears to be just about the man – the sum of all his fears. We always hear Floyd declaring “Pacquiao’s on power pellets, on this, on that…” but not once did we hear him, or perhaps ever will, saying “the die is cast.” He had perfected the art of dodging that it might be really wishful thinking at this stage to see him fight Pacquiao. Floyd is just that good. He’s not great though and will never get there unless an all out war with Pacquiao takes place. Floyd owes it not only to himself but to all boxing fans to cross that rubicon. We’ve traveled this far with him. It’s just one step now to get to that special place. Otherwise, the empire crumbles and we’ll be reminded once more that the emperor really has no clothes. Mayweather, at the end of it all, will be stripped naked and weighed. Judge against the backdrop of a harsher light, the scale won’t tip in his favor. He’ll certainly be found wanting lacking the scalp of the fighter who matters the most during his time. Mediocre Fighters, Average and Above Average Boxers – he fought them all. But never did he fight an All-Time-Great who’s in his face in his time. The undefeated record won’t stand the scrutiny of time either because we all know by now that Floyd defeated Castillo in their first fight the same way Paul Williams did Erislandy Lara recently – which is he didn’t. But there’s hope yet. 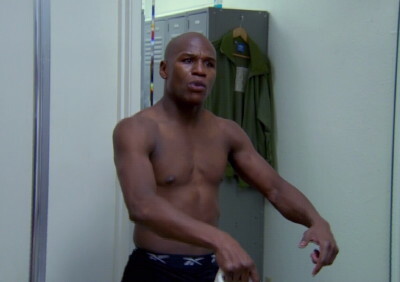 Floyd going gaga in episode 1 of HBO’s Mayweather-Ortiz 24/7 offers hope no matter how slim. He just went ballistic with his dad. All those vitriol, malice and ill will must have come from one deep dark eternal well. Now, if Floyd could just channel those dark thoughts to the proper recipient, he might just go crazy enough to go head on against his real nemesis. We can only hope because it really is up to Floyd. That Rubicon won’t be there for far too long. It might not be sooner or later than Floyd thinks. It might be too late. Mayweather’s next opponent is no chopped liver. Ortiz will be more than happy to be the one to cross that line and claim that coveted place. Not farfetched a scene in boxing where stranger things have happened. How will he be perceived by then?